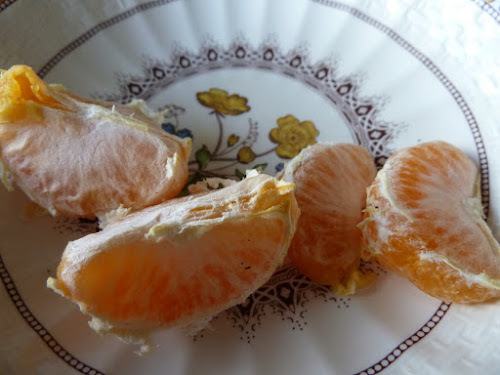 My Home and Garden: Eating my own oranges....I grew that! Eating my own oranges....I grew that! Today I was moving the last three large Lavender Hidcote's from my yard to the yard next door. They were hanging over our sidewalk making it hard to walk through one part of the garden to another. So I moved them to the new Lavender Walk in the large vegetable garden. It is going to be beautiful. I went to the greenhouse to get supplies and noticed the two ripe oranges and snipped them off to take to the kitchen. So now I am sitting, nice and warm and eating one of my own oranges. If that isn't the best gardening experience ever!! Downton Abbey...The best series ever...period. A few blooms in the greenhouse and the house.